Argentine Juan Martin Del Potro’s impressive return to the ATP tour continued today at the Sony Ericsson Open. In first round action, Del Potro defeated Ricardo Mello of Brazil in straight sets 6-4, 6-4. In his post match interview Del Potro was asked if he thought his comeback was on track and if he was back to where [he] needed to be. Del Potro responded that he “didn’t think so” however he added that “I’m improving faster than what I expected.” Del Potro acknowledged that there is a difference in the level of his game versus Nadal and other top 10 players, but he stated that he “is getting closer”. Del Potro is now on a collision course with Robin Soderling in the third round. 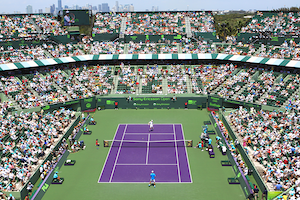 Del Potro faces Philipp Kohlschreiber in the second round, while Soderling begins his Miami campaign against Ivan Dodig. In other first round action 2008 Sony Ericsson Open Champion Nikolay Davydenko was upset by Kevin Anderson. This is the second time that Anderson has eliminated a past champion in the opening rounds in Miami. In 2008, Anderson bounced defending champion Novak Djokovic in the second round. James Blake also advanced in Miami after staging a come from behind win over fellow American Michael Russell. Blake closed out Russell in a third set tie break and will face Thomaz Bellucci in the next round.